Roses, wine, candle lit dinners, those are time tested romantic gestures that will melt almost any heart. For those that look for something different try a liquor gift. 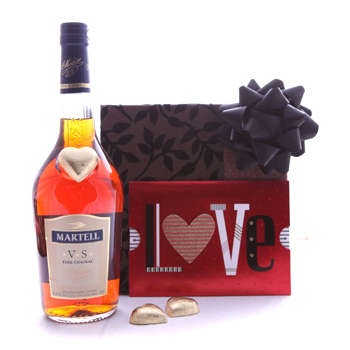 Your partner will indulge in a fiery bottle of Martel VS Cognac, which sets off the sweetness of each bite in the box of assorted Chocolates (150 gr) nestled next to it. Celebrate Valentine's Day, say I love You, or celebrate your anniversary with A Glass Of Warmth. Please note: Gift packaging may vary depending on delivery location.